Brooklyn Wins the World Series ! 1955 was the first year I was interested in baseball. It came with a thud one day (or so I now somehow believe), passed down to me from a father who had been a Dodger fan since his own childhood. And so I too became an avid Dodgers fan, the Brooklyn boy that I was, my Father's son. And I remained a Dodgers fan for decades to come. Brooklyn won its first and only World Series in 1955. I was delirious with joy. All World Series games were in the daytime in those days, and we cajoled teachers, usually with success, into listening to the weekday matches on the radio. We'd race home at the closing bell to catch the last inning or two in the gathering autumn shadows. It's strange the effect and presence I can still sense from those ballpark afternoons, and in particular from those at hated Yankee Stadium, where the final Series game was played. People are either "collectors" or "not-collectors." In my case I had parents on either extreme: the collector father and the avid non-collector mother, someone who could not understand why people would want to own a book with a library just down the road. I suppose I take much more after my father in this aspect of my being -- and there is or will be more stuff about collecting elsewhere. This yellowing newspaper is one of the earliest things that I chose to save. The headline may need some explanation now -- it didn't then, of course, in that very "Daily News" sort of way. As frequent losers in previous World Series, the somewhat mournful and belligerent response from the Brooklyn loyalists always before had been "wait 'til next year!" I endured the team's move to L.A. How could the forlorn ten year old ever guess that fifteen years later he would rejoin them out in California for a while? 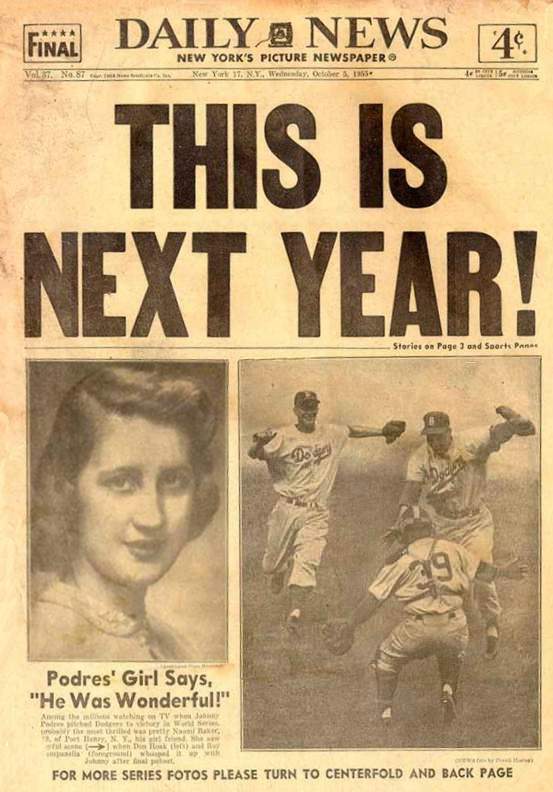 Like curiosity, much of that baseball interest, and in particular Dodger interest, has been extinguished over time. But, the memories -- the sweet memories of childhood!